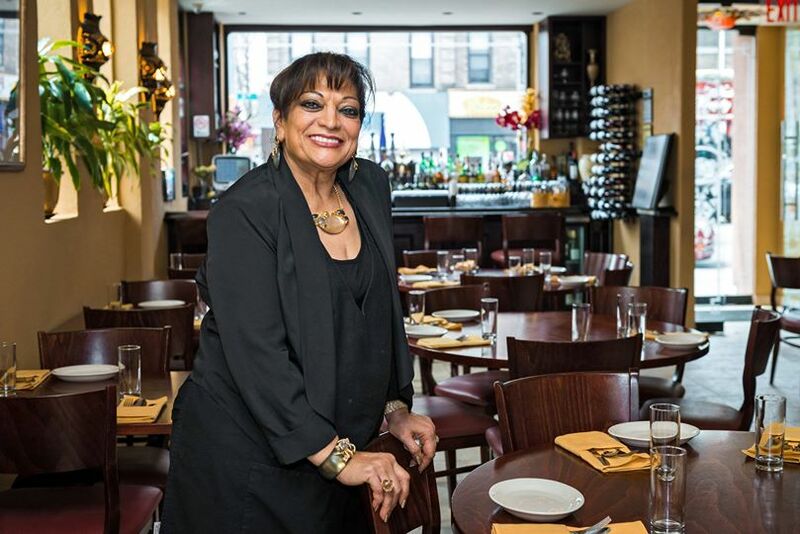 Rawia Bishara, the Palestinian-American chef and proprietor of the Brooklyn-based restaurant Tanoreen has received widespread acclaim for her Middle Eastern culinary creations from some of the most respected food critics and publications in New York City and beyond. Infused with the aroma of nine different spices imported regularly from her hometown of Nazareth, Tanoreen was chosen as New York Magazine's Critic's Pick and has been featured in The New York Times, The Village Voice ("Best Middle Eastern New York" 2011, "Top 10 Middle Eastern" of 2012), The Michelin Guide ("NYC Bib Gourmand", 2011-13), and Zagat, among many others. And in 2014 her long-awaited cookbook, Olives, Lemons and Za'atar (Kyle Books) will be available in bookstores in the U.S. and the UK. When asked about the inspiration behind her cooking, Bishara answers in no uncertain terms: her mother. "My mother was a school teacher, but growing up we always had delicious, home-cooked meals that were healthy and filled with love," Bishara remembers. "Dinner time was about family interaction. It was more than just a meal. My mom put so much time into preparing our food and I wanted to recreate that at Tanoreen." Many doubted that Bishara could run a restaurant successfully with a menu based on meals that take hours to prepare. But Bishara has managed to prove the cynics wrong. She believes that her success is the result of her passion for the food and her knowledge of the stories behind each meal she serves. "We Palestinians have a culinary tradition that goes beyond humus and falafel. Our healthy Mediterranean cuisine is based on our connection to the earth and features wild greens, whole grains, and herbs each harvested in their season." Bishara's innovative cuisine inspired her daughter Jumana Bishara to join her mother's business. Jumana Bishara, who graduated from The American University in Cairo with an MA in Middle East Studies, is now Partner and General Manager at Tanoreen. "I couldn't be more proud than I am to carry on my grandmother and mother's legacy," she says. Rawia Bishara served as the president of the Union of Palestinian Women's Association (UPWA) in North America from 1990-1991. But she considers her work as a chef to be of greater political importance. "Food opens conversation and people see another side of us [Palestinians] that is different than the political. Food is very human and very cultural. It is about life." In addition to sharing her stories and inventive recipes with all who venture into her bustling Brooklyn restaurant or buy her cookbook, Rawia Bishara has also taught her specialty cuisine at the prestigious De Gustibus Culinary School at Macy's in New York City.